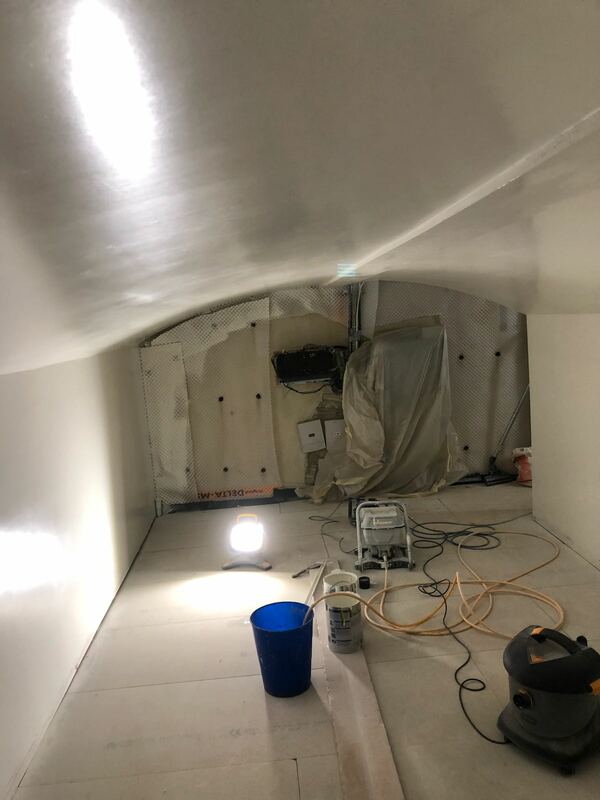 While the Santander bank staff at Marylebone High Street branch were upstairs taking care of our finances, Tapco HomeDry was downstairs damp proofing the basement areas. The areas to be damp-proofed were made up of large, arched vaults, which the bank wanted dry, to utilise for a staff area and dry storage space. It was decided by our PCA (Property Care Association) qualified CSSW CRDS technical surveyor that the best method of damp proofing for this project would be to install a CDM (cavity drain membrane) system. This is a strong but versatile, studded, Polyethylene membrane, which unlike ‘Tanking’ which blocks damp, is designed to allow moisture to continue penetrating behind it, so it can be controlled, collected in a sump and pumped out to a place designated by us. Prior to our part of the work starting, our client, the main contractor, cleared the areas of obstructions and services and had all Asbestos removed by a specialist company, to ensure the areas were safe. On arrival, our technicians first excavated channels and a sump, in preparation for installing special drainage channels and a pump chamber. They then proceeded to install an MS500 cavity drain membrane to the walls and vaulted ceilings, using special ancillary, sealed fixing plugs. A larger studded MS20 membrane was then loose laid over the floors and connected to the wall membranes by a floor/wall joint. A floating, treated tongue and groove chipboard floor were then laid throughout, prior to installing the pump and connecting the alarm, electricity and plumbing, previously installed by us. Galvanised framing and battening were then fixed in position, prior to plaster boarding, scrim taping the joints and plaster setting all to a smooth finish, for our client to paint. All in all, the project took about 3-weeks to complete and was approved and handed over to the bank a short while after. This method of damp proofing is versatile, quick and suitable for many different types of basements, cellars or vaults. This installation is covered by our 20-year guarantee, which was protected by GPI (Guarantee Protection Insurance).